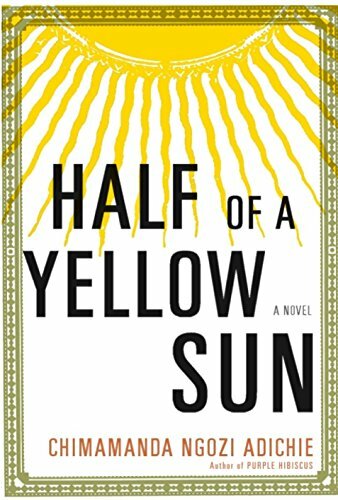 I read Half of A Yellow Sun for my Reading Across Borders challenge. Travelling on from Austria, I hop across the Strait of Gibraltar, trekking across the Sahara to eventually arrive in Nigeria. I arrive in 1960's Nsukka, a small university town in the southeastern, largely Igbo region. Once there, I meet Odenigbo, a Nigerian professor; Olanna, his mistress who is from an elite Nigerian family; and Ugwu, a village boy that is employed as a houseboy in Odenigbo's home. 1960's Nigeria is one of turmoil. This epic story follows the plight of Odenigbo, Olanna, and Ugwu, as they are caught in the middle of the Biafran War. Following discrimination and massacres against Igbo in northern Nigeria, the south-eastern provinces of Nigeria seceeded to form their own nation of Biafra. What follows, both in history and this novel, is a brutal civil war in which hundreds of thousands lose their homes, are forced to flee numerous times, and ultimately face starvation and disease. As Caribousmom has said, this is not a feel good novel. It is a novel about the realities of a post-colonial nation burdened by distinctions of class, race, and ethnicity. It is a novel about the horrors of war. It is a novel about death and destruction. That Chimamanda portrays such devestating topics with such depth, clarity, and compassion, is a sign of a masterpiece. And ultimately, in many ways, it is a story about love and survival. "Olanna watched them and realized with a sweet surge that they all felt what she felt, what Odenigbo felt, as though it were liquid steel instead of blood that flowed through their veins, as though they could stand barefoot over red-hot embers." "Evacuate now! The federals have entered Nsukka! We are evacuating now! Right now! I am going to all the houses occupied. Evacuate now!"... "Gini? What things?" Olanna asked "What will I take?" Baby started to cry. There was the sound again, boom-boom-boom, closer and louder. "It won't be long, we'll be back soon. Just take a few things, clothes." Master gestured vaguely before he grabbed the car keys from the shelf. She hoped Professor Achara had found them accommodation close to other university people so that Baby would have the right kind of children to play with. He writes about the world that remained silent while Biafrans died...In the United States, Biafra was "under Britain's sphere of interest." In Canada, the prime minister quipped, "Where is Biafra?" The Soviet Union sent technicians and planes to Nigeria, thrilled at the chance to influence Africa without offending America or Britain. And from their white-supremacist positions, South Africa and Rhodesia gloated at further proof that black-run governments were doomed to failure. "The world has to know the truth of what is happening, because they simply cannot remain silent while we die." I wonder what really must have been in the minds of those five Majors during the coup leading up to the war...I wonder even much more why a tribe should be so maltreated and killed often by another tribe just in the name of 'residing in a different region' which they wouldn't have dared to do in the Ibo region! Certainly, many people were ignorant, naive but above, those that killed the Easterners; event which led to Aburi convention and eventually the war itself were no doubt malicious and wicked. How can a people be attacked many times and expect them to, each time 'turn the other cheek'! I am sure Christ did not mandate Christians to be that stupid in living out their lives - This ain't religious melo-dramatical acts anyway; it was a shear irresponsibility of a selected oligarchical few that utilized the unfathomable ignorance of so many. Unfortunately, after four decades such tactical strategy is still being used. We really have not made any appreciable leap from where historically the war had stopped. Chimamanda has presented just a mild account of our civil war - presumably, it would have been too gruesome if she had gone ahead to present the whole picture! She has managed to spear the young and the not so young, of too many agonising stories!